iExit Gas tells you the cheapest gas stations at any given interstate exit. It works for all US Interstates and most non-Interstate highways. It also supports Unleaded, Mid Grade, Premium, and Diesel prices. When you open iExit Gas on the road, it will automatically place you on the highway, listing upcoming exits with the cheapest gas station (for the selected fuel type) at each exit. If you're stopped at an exit and want to plan your next stretch, or even if you're sitting on your couch at home, iExit Gas allows you to look up any highway across the country, regardless of where you are located. If you prefer to search around a given location instead of along the highway, you can do that as well. 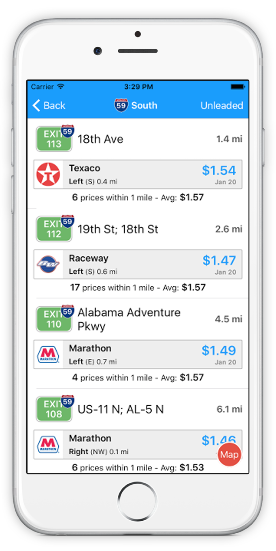 "When you're looking to exit the interstate for cheap gas, iExit Gas is your app." explains iExit founder, Evan Metrock. "There are lots of gas price apps out there already, yet hardly any take into consideration your direction of travel. iExit Gas shows you only stations at exits ahead of you, and then highlights the cheapest station at each exit. It doesn't get much easier than that." iExit Gas is launching on iOS only, but will be available on Android in March 2016. It will eventually be priced at $1.99, but will only be $0.99 for its first 30 days on the market. Real-time gas prices are sourced by OPIS and are updated daily. Gas prices will also be made available in the premium version of iExit, available for $2.99 on iOS and Android. Already-existing iExit users will receive access to gas prices for free. For more information, please contact us at gas@iexitapp.com, or visit iExitGas.com.